Incredibly useful weeding and planting trowel. 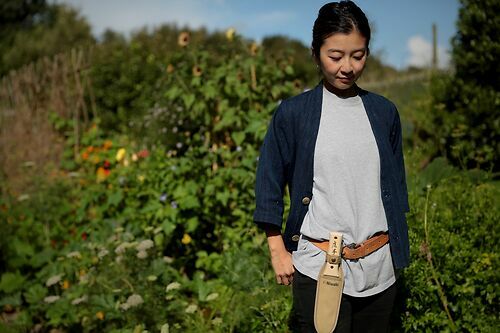 Hori Hori in the Long Holster. A perfect fit. Spectacular tool, how did I ever garden without it? Japanese trowel, all-round weeder, bulb-planter supreme and general subterranean rummager.... the carbon steel blade runs right into the handle, so it's tough and strong, but not invincible. Brilliant for planting bulbs, weeding and all sorts of garden stuff - but whatever you do don't take it as carry on luggage. Comes with a tough canvas sheath, or upgrade to the heavy duty Long Holster option for a perfect fit.